Gummy Bear, Silicone or Saline Implants: Which is Right for You? Home » Aesthetic News » Breast Augmentation » Gummy Bear, Silicone or Saline Implants: Which is Right for You? If you’re thinking about enhancing your bust line, there are several considerations when choosing which breast implant is right for you. There are three basic types currently approved by the FDA: saline, silicone and a form-stable cohesive gel nicknamed “gummy bear” implants. Each offers its own advantages in the areas of longevity, aesthetics and recovery times. 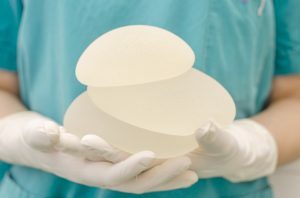 The type and size of breast implant you choose will help determine the method of placement your plastic surgeon employs. Some implant types have a higher risk of complications like capsular contracture or rippling, which is why it’s a good idea to educate yourself so you can make an informed decision before having breast augmentation. There is no single best implant type, as each has its own benefits and differences in appearance, feel and performance. Saline implants contain sterile salt water and are the most cost-effective option for women seeking breast enhancement. Most saline implants are empty, and are filled after they are placed inside the body. Because of this, the placement incisions are much smaller, meaning less pain, smaller scars and a shorter recovery process. Saline implants offer a great degree of upper pole fullness, and shell rupture is easy to detect since the breasts will quickly deflate. Saline implants do have potential drawbacks. There is a higher risk of spontaneous deflation, the implants are more prone to “rippling” or wrinkling compared to silicone, and some patients say they feel too firm and less like natural breast tissue. Over the past decade, silicone implants have eclipsed saline in terms of popularity – both in the United States and abroad. Today’s silicone implants come in different shapes, sizes and textures, letting women achieve their desired look. If you want more upper pole fullness and projection, you may opt for a round implant, whereas teardrop – or anatomical– shaped implants produce a more subtle and natural-looking enhancement. Silicone implants are made with a thick gel, and are widely considered to be the most natural-feeling implants available. Approved for breast augmentation or reconstruction in patients 22 and older, silicone implants have less chance of rippling compared to saline, and generally have a longer lifespan. Silicone breast implants do require a slightly larger incision and ruptures are harder to detect since the silicone gel stays in the breast pocket. So-called gummy bear implants are the latest addition to the market, gaining FDA clearance in 2012. Since then, several manufacturers have begun offering a variety of form stable implants made with a highly cohesive silicone gel that is thicker and more stable than traditional silicone gel. Praised for their “memory foam” like qualities and durable shape retention, gummy bear implants score high for patient satisfaction. Cohesive gel implants have the consistency of gummy bear candies, and are said to maintain their shape longer compared to saline or regular silicone. Form stable implants are available in different projection options, allowing more flexibility for enhancement options. Every patient is unique, with their own concerns and personal goals that will largely impact their choice of implant. An in-depth consultation with a board-certified plastic surgeon who specializes in breast surgery will help you decide which implant type is best for your individual case. To find out more about breast augmentation and your candidacy, Dr. Thomas W. Loeb offers private consultations in his Manhattan office. Call 212-327-3700 to schedule your appointment today.